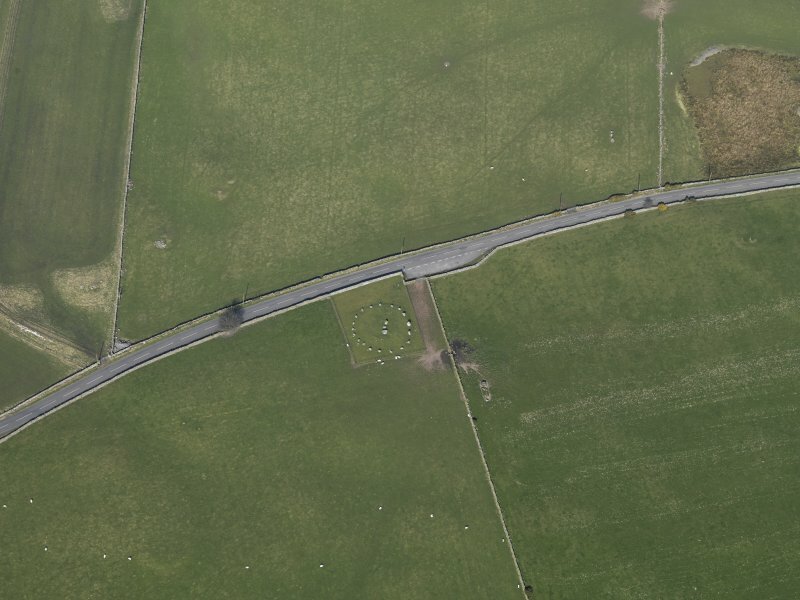 Oblique aerial view centred on Torhousekie stone circle, taken from the N.
Oblique aerial view centred on Torhousekie stone circle, taken from the NE. 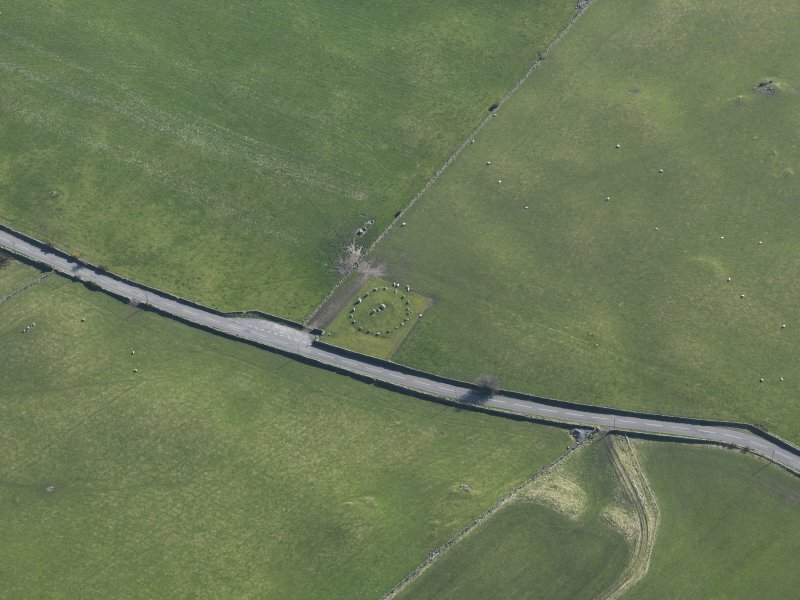 Oblique aerial view centred on Torhousekie stone circle, taken from the SW.
Oblique aerial view centred on Torhousekie stone circle, taken from the SE. 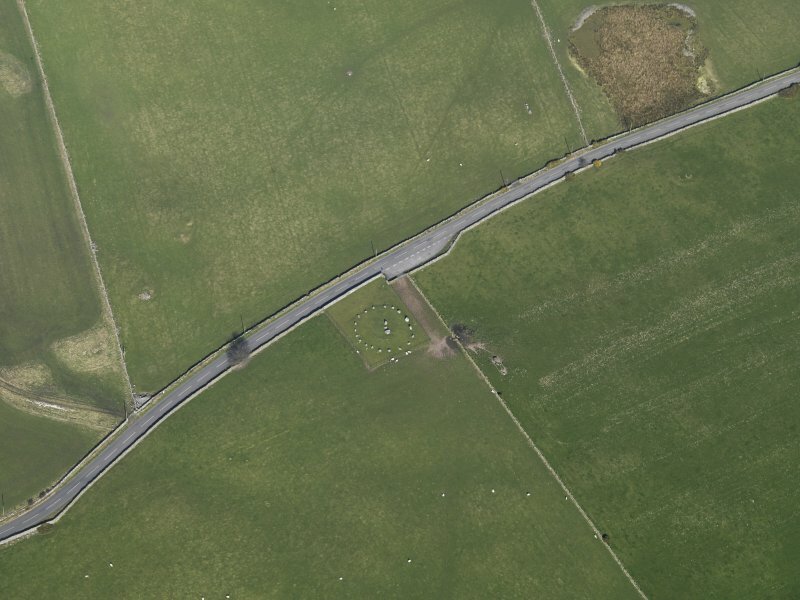 Oblique aerial view centred on Torhousekie stone circle, taken from the S.
Oblique aerial view centred on Torhousekie stone circle, taken from the SSW. 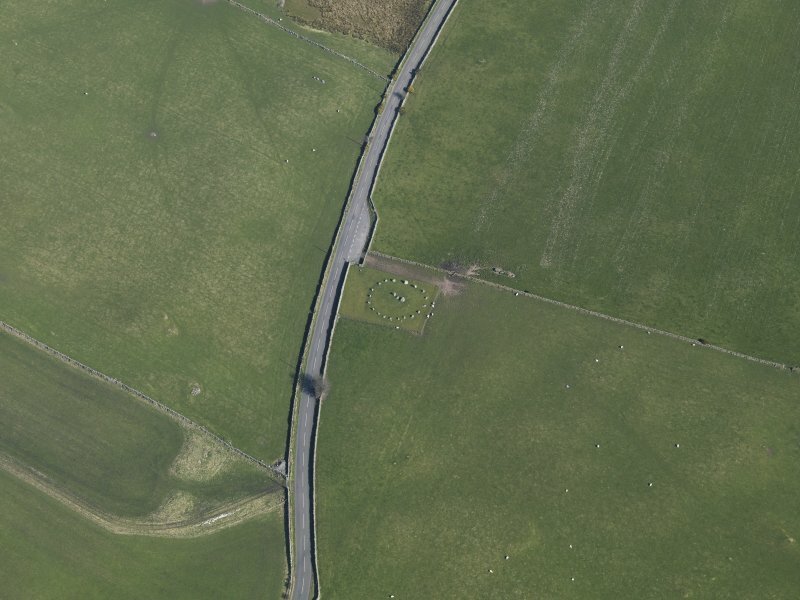 Oblique aerial view centred on Torhousekie stone circle, taken from the WSW. 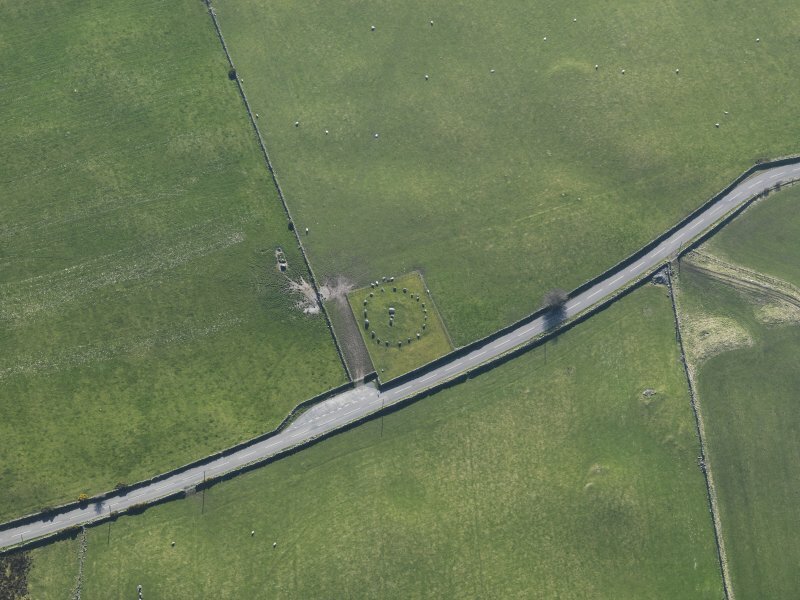 Oblique aerial view centred on Torhousekie stone circle, taken from the WNW. 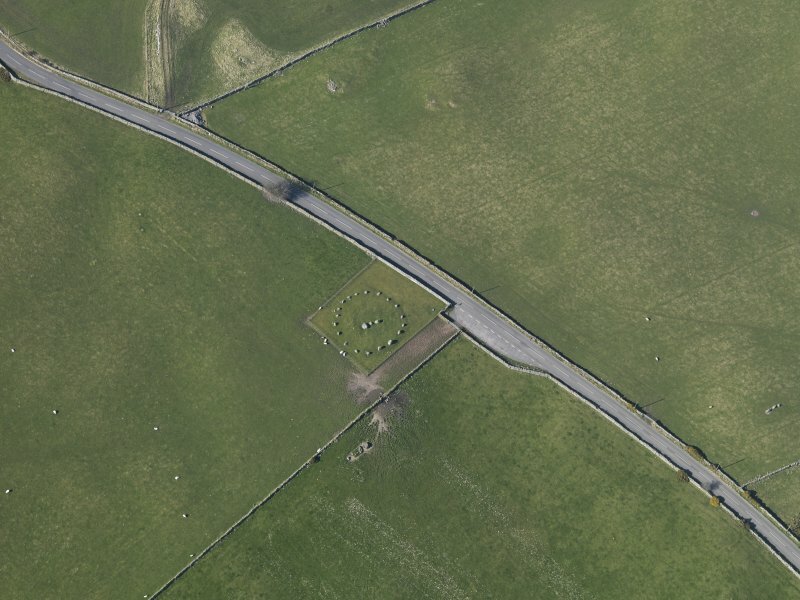 Oblique aerial view centred on Torhousekie stone circle, taken from the NNW. 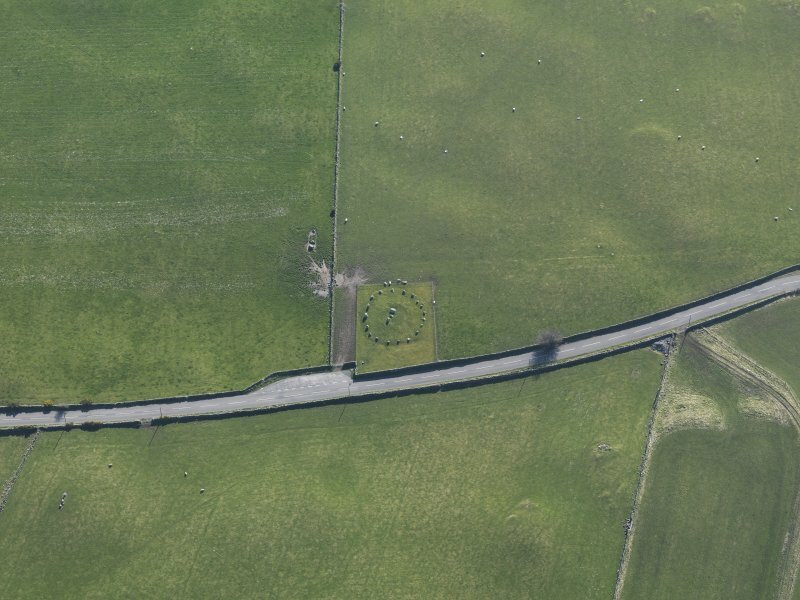 Oblique aerial view centred on Torhousekie stone circle, taken from the E.
Stone Circle consisting of 19 granite boulders set on end on the circumference of a circle about 60' - 65' in diameter. Three upright boulders stand in a line near the centre of the circle. The low arc of rubble adjoining these to the NW may be of later date than the boulders. The stones range in height from about 2' to 4'9". The interior of the circle has been made a dumping ground for field clearance, but it is not so stony as to suggest the site of a cairn which has been removed. In 1684 the three central stones were known as 'King Gauldus's Tomb' - Galdus being a mythical Scottish king. A Symson 1823; RCAHMS 1912; R W Feachem 1963. Name confirmed (Ministry of Public Buildings and Works plaque). Visited by OS (WDJ) 18 August 1970. 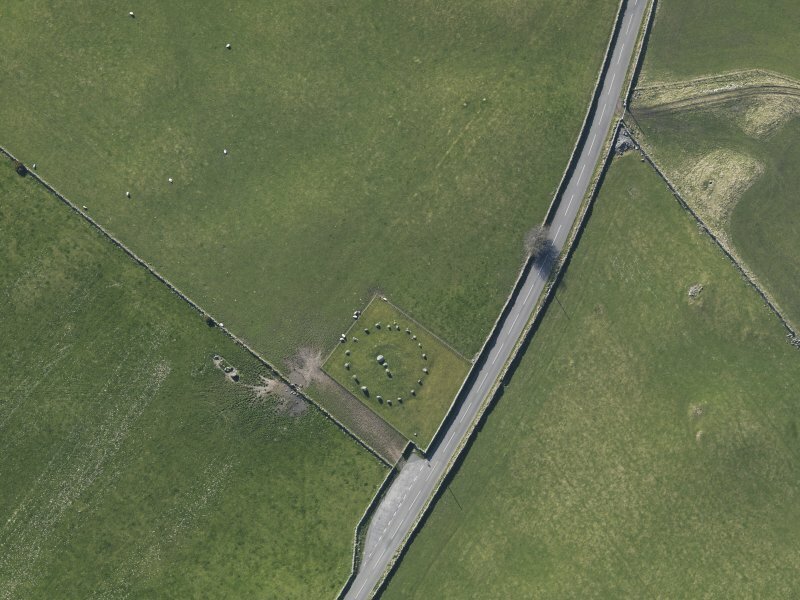 Scheduled as Torhouse Stone Circle. Information from Historic Scotland, scheduling document dated 16 July 2002. Standing beside the public road, the stone circle at Torhousekie is one of a cluster of megalithic monuments and cairns scattered across a low-lying terrace on the north-east bank of the River Bladnoch. The circle itself is the best preserved component of this complex and is a Guardianship Monument maintained by Historic Scotland. Its preservation, however, may owe as much to its long antiquarian history and the tradition that the three stones that extend in a line across its centre mark the tomb of King Galdus. The nineteen stones of the surrounding circle were first enumerated as long ago as 1684 in Andrew Symson’s description of Galloway (Mitchell 1907, 74), and other reports appear in the Statistical Accounts, albeit bathed in a Druidic hue (Stat Acct, xiv, 1795, 487; NSA, iv, Wigtownshire, 2). The first detailed observations and measurements are recorded at the end of the 19th century by Coles (1897) and in 1911 by Alexander Curle (RCAHMS 1912, 183–4), both of them drawing up plans that compare well with the more recent surveys of Burl and Alexander Thom (Burl 1972; Thom et al 1980, 274). 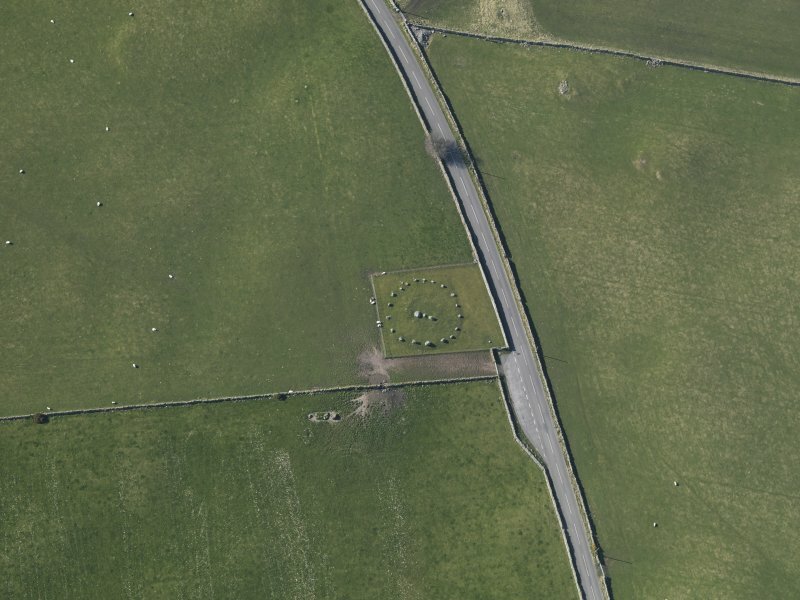 Now enclosed by a wire fence set in a neatly mown sward, the nineteen rounded orthostats are set out around a slightly raised platform to form a circle about 22m in overall diameter, with a flattened arc on the east-south-east. The stones display subtle patterns of grading in both height and spacing, best seen in Burl’s plan and extended elevation (1972, fig 1). The smaller ones stand closest together around the north-west arc, while the tallest comprise three between 1.05m and 1.3m in height on the east-southeast, followed closely by a pair 0.9m and 1m high on the south-west; the shortest is on the north-north-east. The alignment in the middle lies roughly north-east and south-west, and comprises two bulky boulders a little over 1m high flanking a much smaller stone no more than 0.65m high. The ground around this central setting has been dug out to form a shallow hollow in the surface of the platform; D-shaped on plan and defined by a low stony lip, this was first recorded by Curle in 1911, but it may have more to do with the removal of some of the field-cleared stones that had been dumped around the central setting in the late 19th century than a specifically antiquarian investigation (Coles 1897, 90). 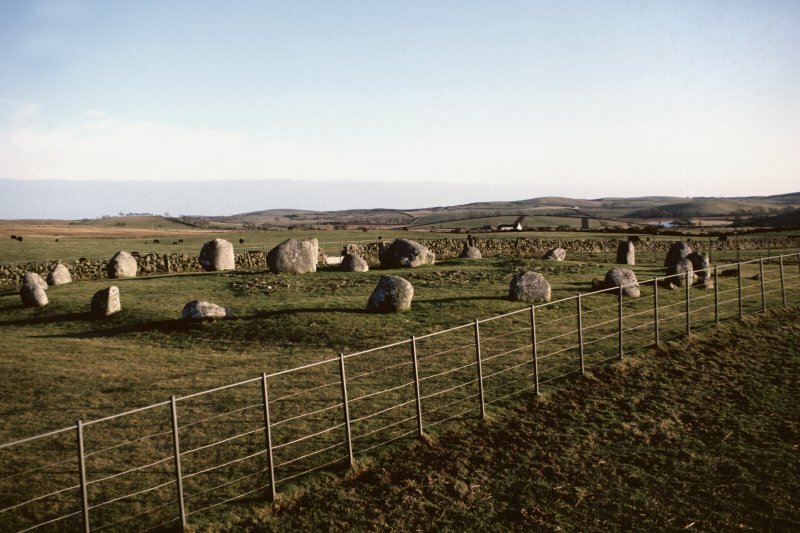 A connection between Torhousekie and recumbent stone circles was first made by Burl, who argued that the three stone alignment at its centre was reminiscent of a recumbent setting standing within the projected circumference of a flattened circle (1972, 29–30). 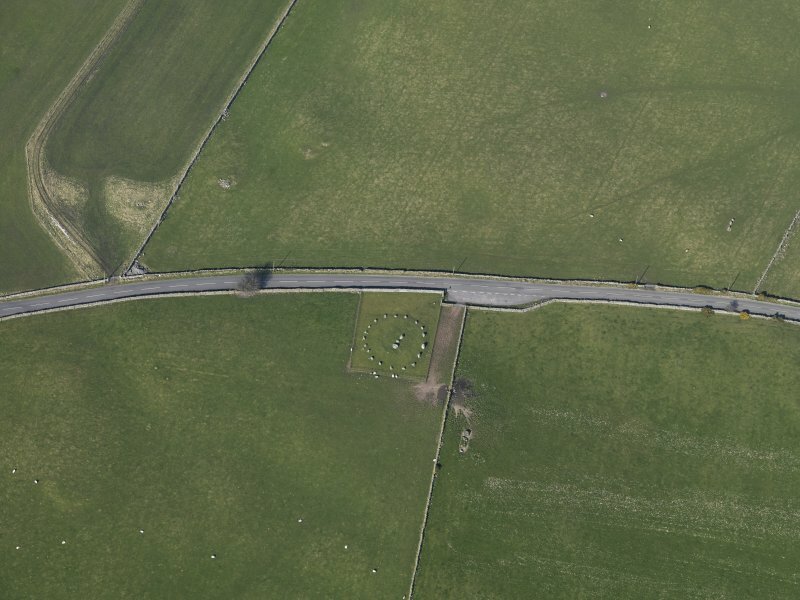 In particular, he associated it with the recumbent stone circles of Kincardineshire, where several of the settings form a flattened facade facing south-east or south-south-east and link the ring of orthostats to the kerb of an internal cairn (eg The Nine Stanes, Garrol Wood). Thus the flattened east-south-east arc of the Torhousekie circle and the grading of its stones fell into place, while the D-shaped disturbance of the interior, mainly lying to the north-west of the three stones at the centre, was explained as the remains of a ring-cairn (1972, 30; 1976a, 211–12, 365 Wig 5; 2000, 435, Wig 8a; 2005a, 171). The case is neither convincing nor helpful. It is not just that there is no superficial resemblance between Torhousekie and any recumbent stone circle in the North-east (Burl 1972, 29), but there are no shared points of detail. 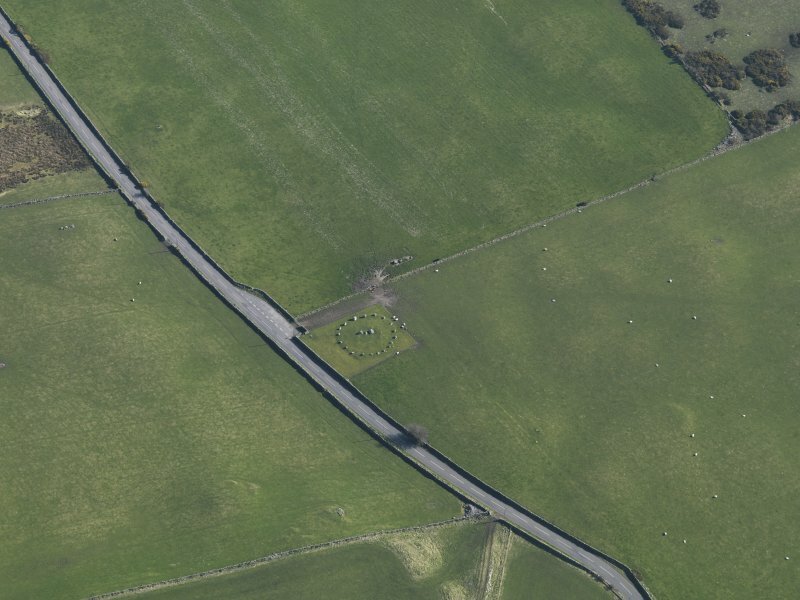 The supposed ring-cairn within the interior has nothing to recommend it as an ancient construction, and there are no examples of a recumbent setting in the North-east standing at the centre of a circle. We are left with the resemblance to the lone setting of stones in the kerb of one of the ring-cairns on Campstone Hill, Raedykes, which is so distant that it is hard to believe that it is of any real significance (cf Barnatt 1989, 35–6). Curiously, the three taller stones that form the flattened east-south-east arc of the circle provide a better comparison for the way in which recumbent settings are employed to form a facade, and yet this has passed unnoticed. At the heart of the argument is the search for architectural stepping stones between supposedly similar stone circles in south-west Ireland and north-east Scotland, to manifest the transmission of ideas between the two areas. 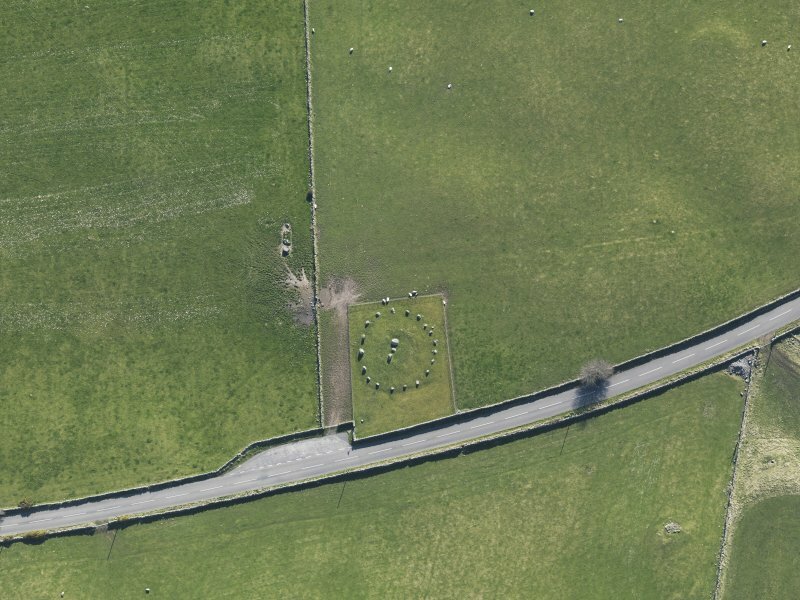 The discordant chronologies and designs of these two groups of stone circles have now rendered any direct linkage redundant, and it is surely more important to seek the affinities of Torhousekie in a local context. 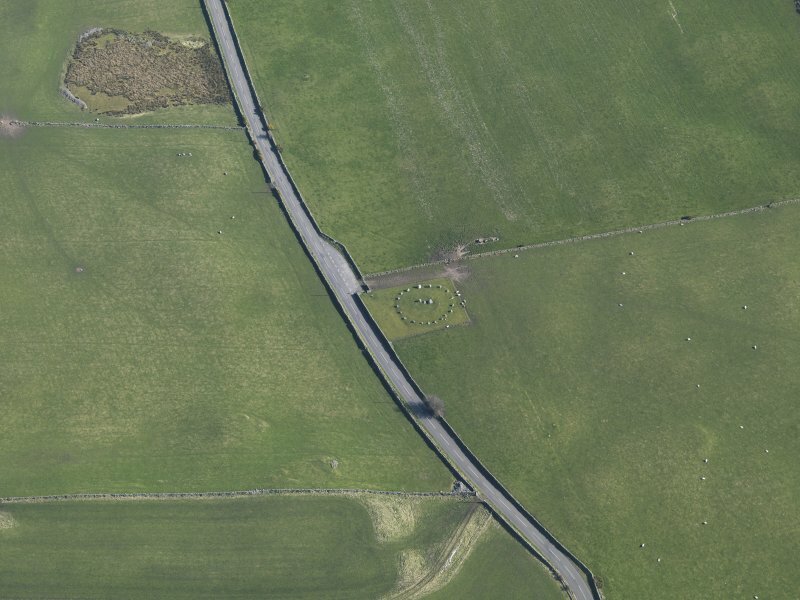 To this end the circle is still unusual, but the surviving example of a low circle of stones surrounding a raised platform with a single central monolith at Glenquicken, in the Stewartry (NX55NW 1, 5 &12), points up one line of enquiry (see for example Burl 1976a, 206, fig 37), while the axis of the central alignment towards the south-west, and indeed the two taller stones in the south-west arc, provide a link to the way this quarter is referenced in different ways in funerary monuments throughout the country.